Do you have a vehicle* of some kind that you are thinking of selling or trading in? If you are, please consider placing it into the BFC Vehicle Donation Program! 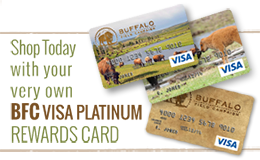 The proceeds of your vehicle sale will keep our vital buffalo protection efforts going! Simply call 1-888-205-3420, and a friendly vehicle donation specialist will help you schedule your pick-up appointment. Or if you would rather have someone call you, simply fill out our quick and easy online vehicle donation form. FAST – your appointment for pickup will be scheduled the very next day if you call in (or complete the online form) by 2pm EST. FREE – your vehicle is picked up at no charge to you. CONVENIENT – Whether at home, work, the auto shop, or almost anywhere else**, our program will it pick up your vehicle, give you a receipt, process all of the required title documents, and get it out of your way. GAIN YOURSELF A TAX DEDUCTION – your donation is tax deductible to the full extent of the law. SAVE TIME – save yourself the time and hassle of trying to sell it yourself. FEEL GREAT – knowing that your car will further our mission to protect wild buffalo! BFC has partnered with an excellent, reputable car donation processor, the Vehicle Donation Processing Center, who makes all arrangements at no cost to you. They handle the title transfer requirements, and when they pick-up your car they give you a tax-deductible donation receipt on behalf of BFC. Want more information? Visit the FAQ page or click here to donate your car and a helpful representative will call you shortly. Alternatively, you may call our car donation program 24/7 at 1-888-205-3420. ** VDPC picks up vehicle donations nationwide; however, they are not able to service all areas. If for some reason they are unable to service your area they can generally inform you of that in your first call to the Vehicle Donation Processing Center, and in any case, they will let you know within 24 hours if they will be able to pick up your car donation in a timely manner.